July 2014 – Amazing summer so far! With warm temperatures and plenty of sunshine, residents of Greater Moncton and Southeast New Brunswick could not have asked for a better July. 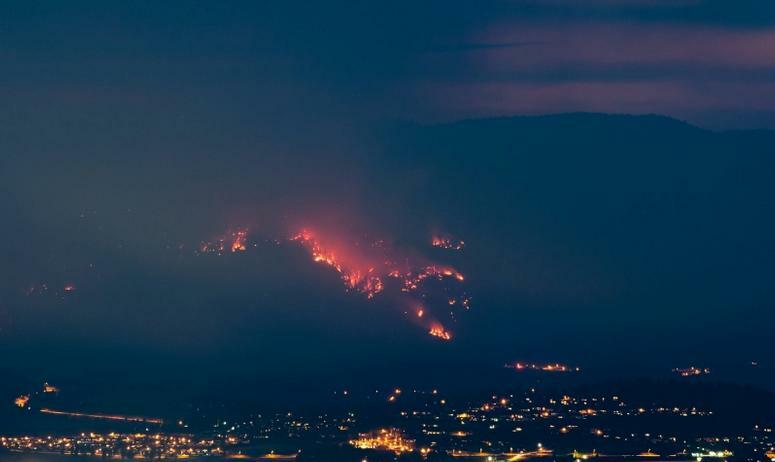 Environment Canada says the average temperature during the month was 2.3 C above the thirty year average while rainfall was about 20 percent above normal. 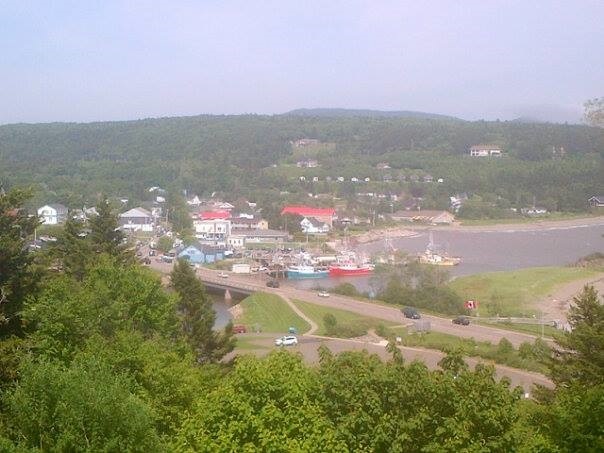 The only spoiler was Arthur – a nasty post-tropical storm which pounded the province on 05 July with gusty winds at times stronger than hurricane force bringing down trees and power lines. 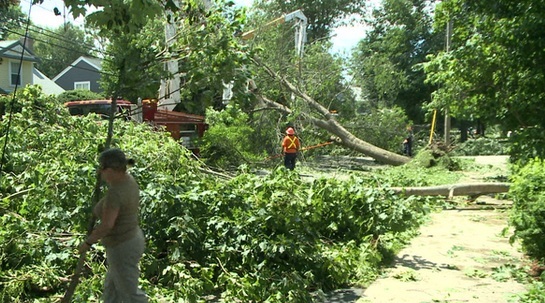 Thousands went without electricity for days in the Fredericton area. The full Moon appeared bigger and brighter last night – the July “Supermoon”! The Supermoon occurs when the Moon becomes full on the same day as perigee – the point at which the Moon is nearest Earth each month so it can appear up to 30 percent brighter. This effect can be enhanced if you are viewing the Moon near a horizon or through trees and other foreground objects. 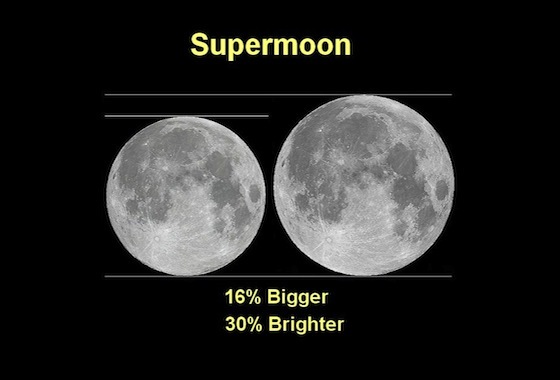 In fact, this summer will bring three “Supermoons”— 12 July, 10 August, and 09 September. Arthur packed quite a punch across the Maritimes yesterday with strong, gusty winds along the Bay of Fundy, across southern New Brunswick and Nova Scotia’s Annapolis Valley. Environment Canada is also reporting impressive rainfall amounts with a whopping 143 mm at St. Stephen – more than a month’s worth of rain in less than 24 hours! Meantime, rain was light across Prince Edward Island, eastern Nova Scotia and Cape Breton. Greater Moncton seems to have been spared the worst of Arthur with a peak wind gust of 67 km/h and about 36 mm of rain. Arthur made landfall in the Maritimes as a post-tropical storm near Meteghan, Nova Scotia around 7:30 a.m. today. Forecasters at the Canadian Hurricane Centre say winds are strongest to the right of the storm in the Annapolis Valley (topping 140 km/h) and rain has been heaviest to the left of the storm in central and southern New Brunswick (over 150 mm). 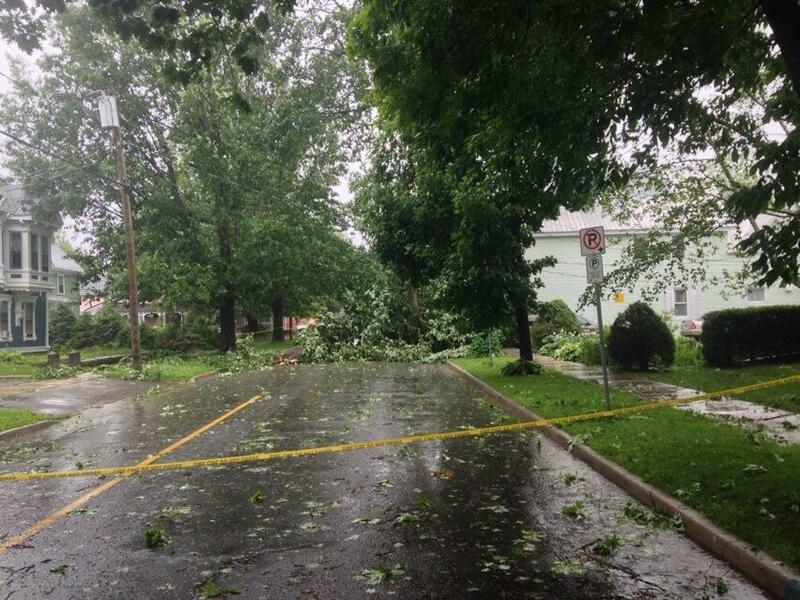 More than 200,000 customers have lost power in the region with social media users reporting flooding and downed trees in Saint John, Fredericton and Halifax. In Greater Moncton, periods of heavy rain and gusty winds have been ongoing since this morning with leaves, branches and even a few trees coming down. 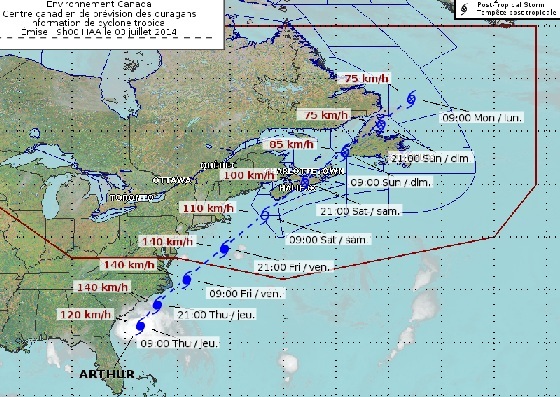 What can New Brunswick expect from Arthur? Accuweather is suggesting New Brunswick and Prince Edward Island will bear the brunt of the rain from Arthur while Nova Scotia will receive the strongest winds from the storm. By the time Arthur arrives in the Maritimes on Saturday, it is expected to be downgraded from a hurricane to a tropical storm. Greater Moncton could get winds gusting between 65 and 95 km/h with anywhere from 50-100 mm of rain. Forecasters say the season’s first hurricane is expected to bring significant rain and wind to the Maritimes on Saturday. Arthur became a hurricane today with maximum sustained winds of about 120 kilometres per hour. Forecasters say a trough of low pressure will move eastward from the Great Lakes and guide the storm toward the Maritimes. The Canadian Hurricane Centre says the storm’s projected track has been moved slightly to the west with significant rain and wind for the Maritimes but it’s too early to make rainfall and wind speed predictions. Environment Canada issued a heat warning today for all of New Brunswick and it will remain in place for 02 July as well. A warm and humid air mass over the Maritimes has resulted in humidex values reaching and exceeding 40. Only some coastal areas will escape the heat, especially along the Fundy coast where onshore southwesterly winds will bring cooler temperatures. Greater Moncton climbed to 31.3°C (humidex 38) today but the hot spot in the province was Bathurst at 34.2°C (humidex 40).